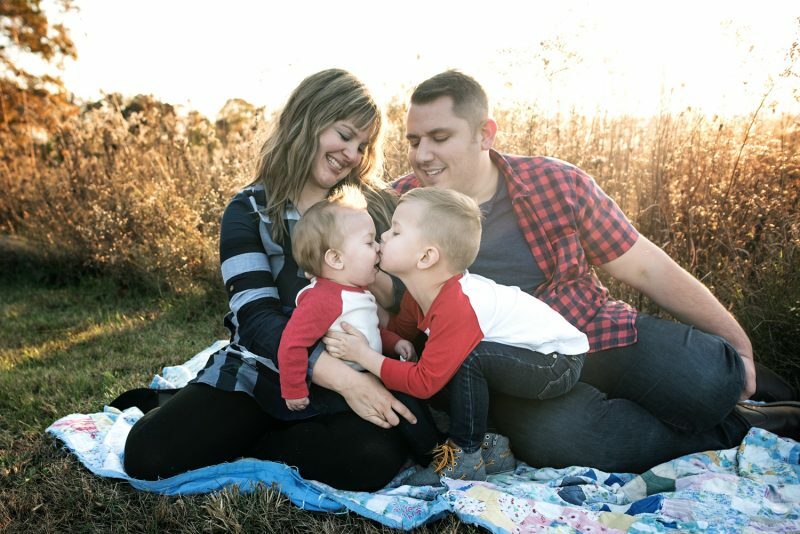 The Beres Family: Fitz, 9 months, is loved by big bother Luca, 4, and parents Matt and Mallory. Matt and Mallory Beres keep a large black-and-white photo taken shortly after their 9-month-old son, Fitz, emerged from surgery in December. 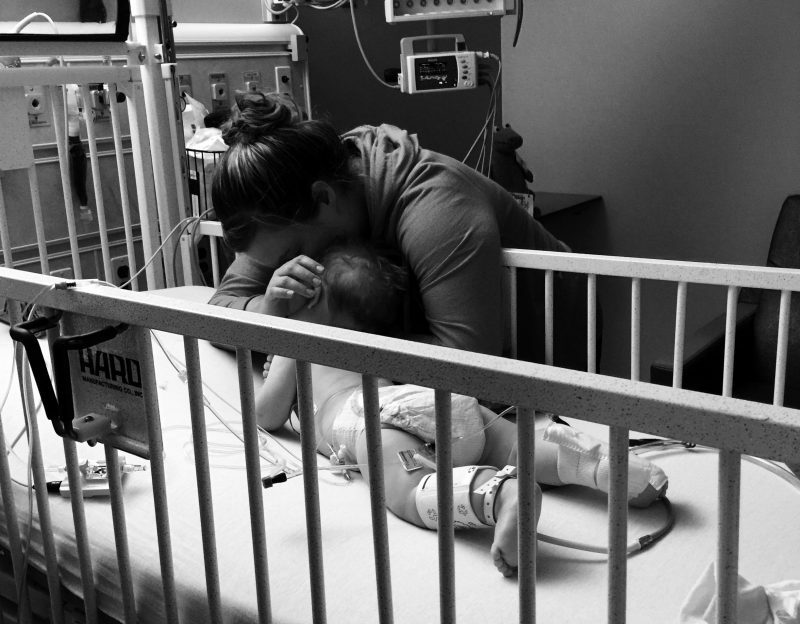 In the photo, Mallory is hunched over a hospital crib cocooning Fitz, who had been under anesthesia for 8 hours as surgeons reconstructed the front of his skull. Mallory wanted to make sure Fitz could feel her comforting presence. Mom Mallory comforts Fitz in the recovery room. Fitz was born in February 2017 to Mallory and Matt, both schoolteachers from Wooster who met through eHarmony and decided to marry 3 weeks later. The plates in Fitz’ skull were very close together, and his soft spot was smaller than normal. 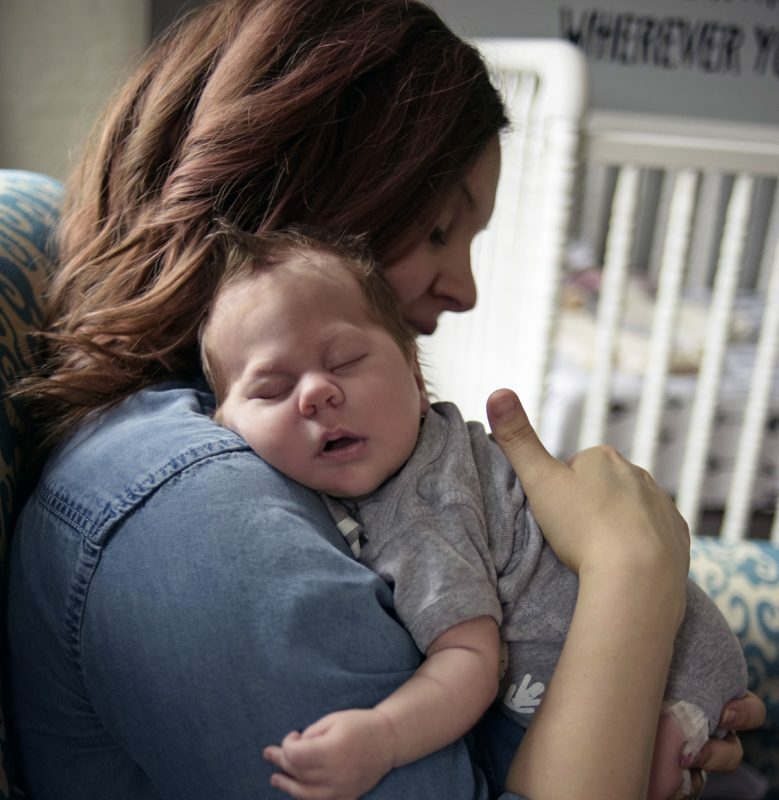 The condition is called craniosynostosis, a premature fusion of bones in the skull. It’s more common than one might think, occurring in about 1 in 2,000 births. The cause is unknown in many cases. A baby’s skull is made up of bony plates separated by fibrous tissues that allow the brain to grow. In Fitz’ case, the bones in his forehead had grown together abnormally, putting pressure on his brain and creating a ridge from the top of his head to his forehead. Fitz was referred to craniofacial surgeon Dr. Niyant Patel of the Plastic and Reconstructive Surgery Center at Akron Children’s Hospital. 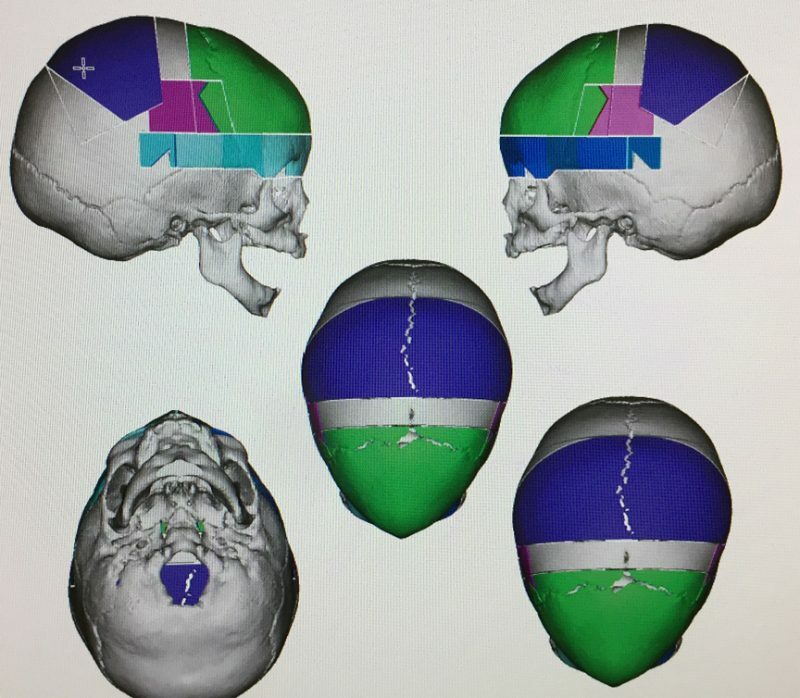 Mild cases of craniosynostosis may not require surgery, but Dr. Patel knew upon examination that Fitz’ skull shape was significant and surgery was necessary to expand and reshape it. 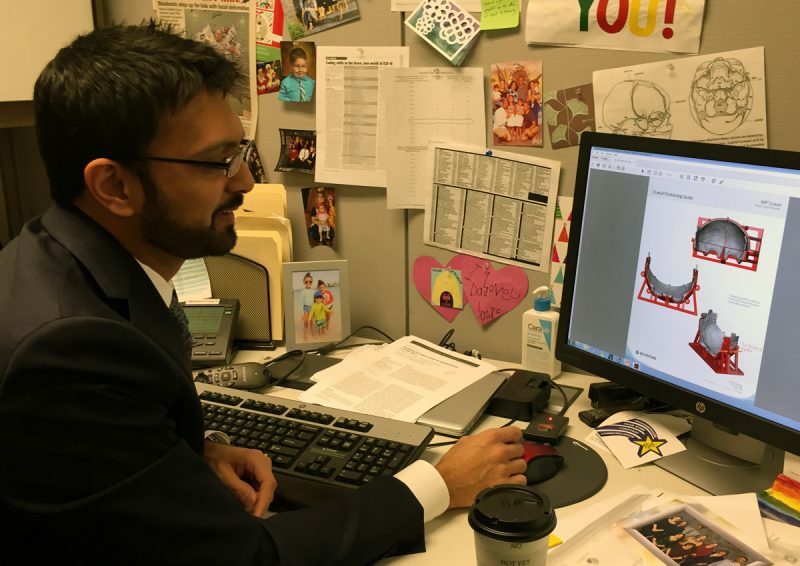 Dr. Patel reviews 3D images of Fitz’ skull. 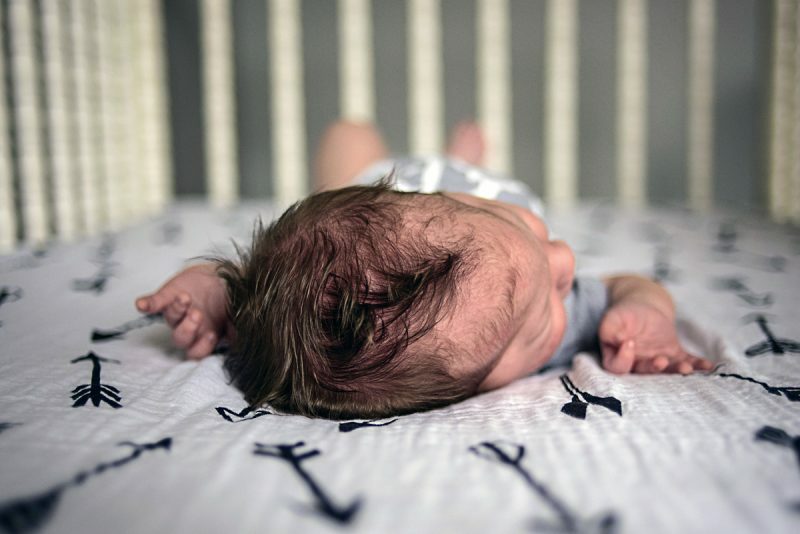 Dr. Patel sees many of these cases and performs about 30 craniosynostosis surgeries a year with Dr. Tsulee Chen, director of the Division of Pediatric Neurosurgery. Dr. Patel and Dr. Chen spend a lot of time walking parents through the process, preparing them for each step, showing photos of babies who have had the surgery. The couple cautiously watched Fitz to see to see if craniosynostosis affected his motor skills, if he was making eye contact and cooing. They saw specialists including ophthalmology, speech and neurodevelopment. They were relieved that Fitz’ condition did not seem to affect his brain function. Matt and Mallory relied heavily on their faith, family and friends. 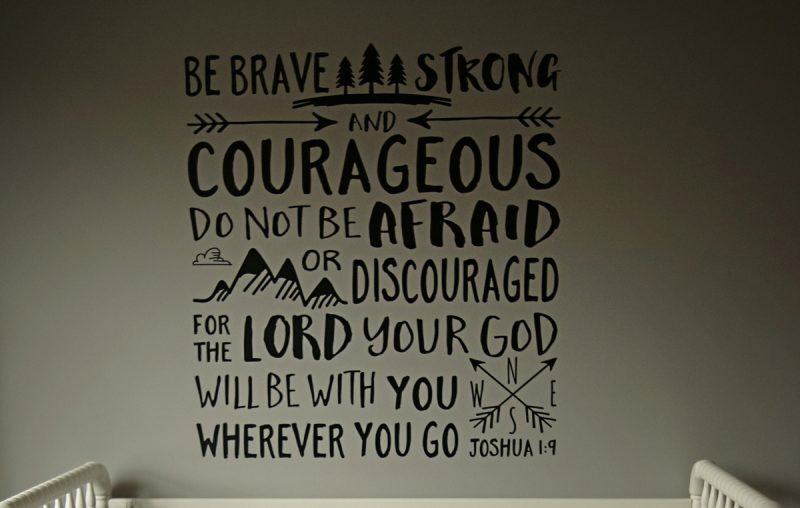 They had shirts printed with the Bible verse they had written on Fitz’ wall. Their oldest, 4-year-old Luca, wore his shirt to preschool the day of surgery. Throughout that day, more than 20 friends and family members sat with Matt and Mallory in the surgical waiting room. 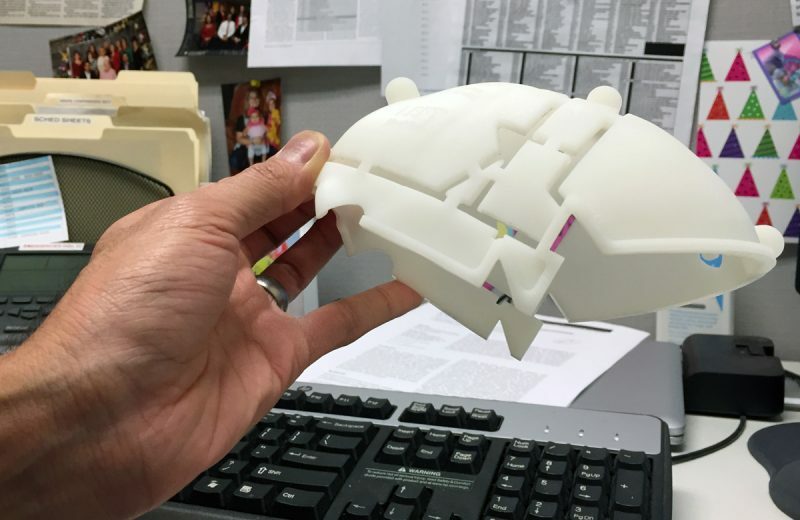 For Fitz’ surgery, biomedical engineers helped create a 3-D guide to mark the cuts. Doctors used grafts to reshape bone and absorbable polymer material to hold the new shape together. Dr. Chen said it was evident that Fitz’ skull was pressing against the front of his brain. Dr. Chen said the front of his brain had taken on a triangular shape, and she could see it start to round to a normal, curved shape after the pressure was relieved. “He’s done!” Matt posted on Facebook around 5:00 that afternoon. “The team was super impressed with his stamina during surgery. The plastic surgeon said his forehead is smooth and beautiful and he gained an inch of space around his brain! This boy is set up to THRIVE! Two days later, Matt and Mallory took Fitz home with his eyes swollen shut from the operation. They were prepared for the swelling to last several days. Fitz was frustrated not being able to see. Matt and Mallory talked and sang to him, played familiar music and held him constantly. “We felt so bad. It was hard and confusing for him,” Mallory said. Fitz was all smiles just a few days after surgery. As his blue eyes gradually opened, Fitz’ returned to his old self. “He woke up this morning and we could actually see his eyes!” Matt posted on Facebook the next day. 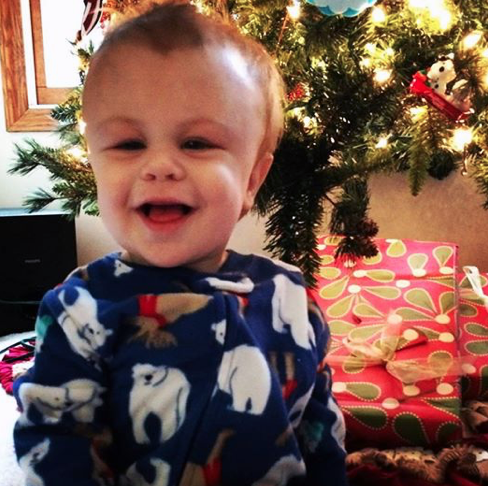 “Through the day the swelling went down a bit and he could see fairly well… He even started crawling around, pulling himself up, and waving! 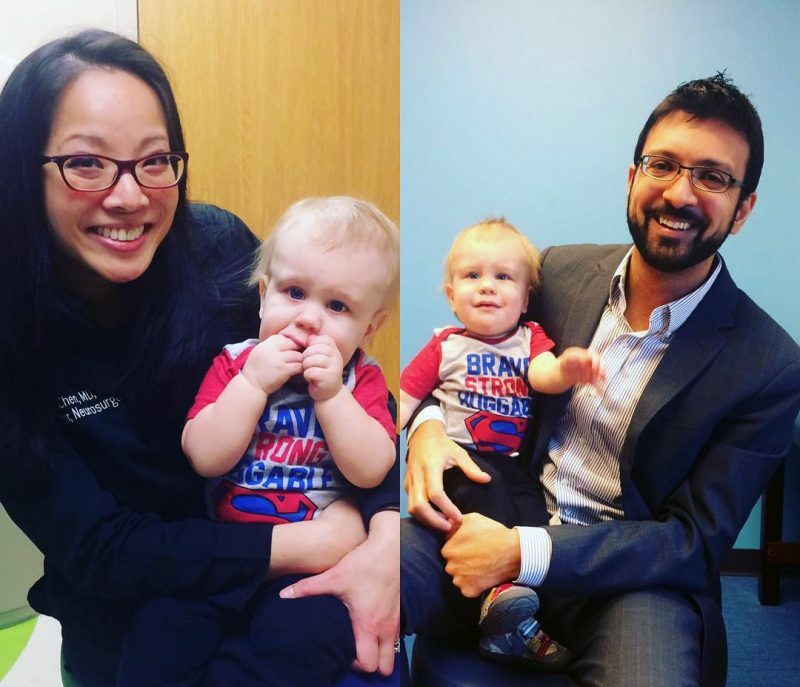 During a checkup 6-weeks after surgery, Dr. Chen (left) and Dr. Patel say Fitz’ skull shape is now perfect and are pleased with the milestones he’s achieving, such as babbling, waving, pulling himself up and taking steps with help!